If great website copy is what you need – always written with SEO in mind – you’ve come to the right place. All web and print media editing work is done to the highest standards. Your copy will be clear, correct, concise, complete and consistent (the “five Cs”). If you feel that your marketing communications would benefit from a second opinion I’m always happy to review these for you too. For businesses outside the UK which want to sell products or services in the UK I offer a UK localisation service. I can take your website content, product manual or any other type of text document and localise it for the UK market, ensuring that to your target audience it appears to have been developed locally. I always welcome the opportunity to work with international brands. If you have some writing that’s been translated into English, but perhaps not very well, I can give it a polish for you. I can generally turn awkward Spanglish, Franglish, Chinglish or Japlish into clear, perfect prose. Please click here to see some examples of my work. If you don’t see the type of writing assignment you have in mind give me a call anyway. There’s a good chance that I’ll be able to help you in some way. Please visit the FAQs section for information about my fees, obtaining quotes and my Terms and Conditions. 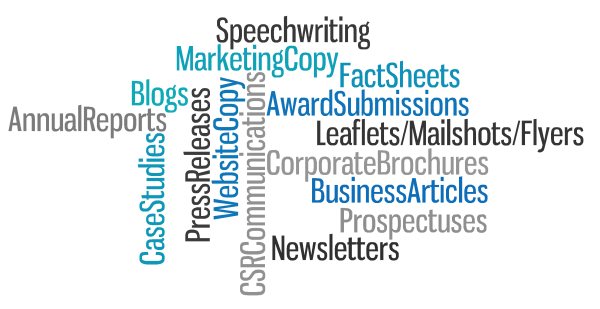 There’s some useful information in the FAQs on how to brief a copywriter – in the world of copywriting “the better the brief the better the end-product”!